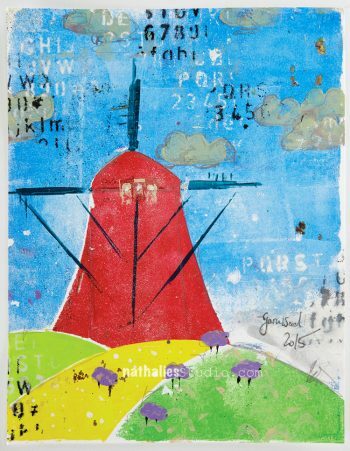 In her workshops, Nathalie teaches students how to use various printmaking and art journaling tools, supplies and mixed media art techniques. 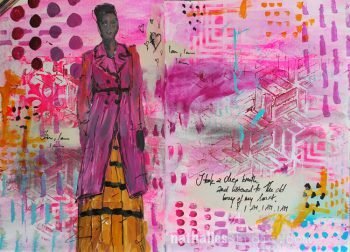 Her teaching method is designed to help students unlock their personal creativity in their personal art journals and mixed media prints. 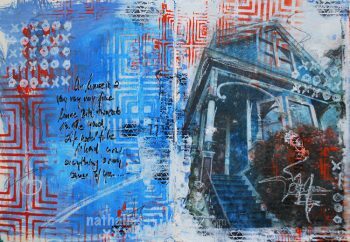 You are sure to have Artful Adventures in this weekend of art journaling and mono print painting classes with Nathalie Kalbach! Price: $178 Lunch, drinks, snacks & some supplies and tools are included. 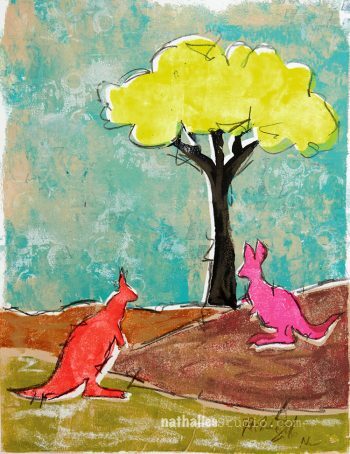 Join us in a day-long Mono Print Painting workshop. You will dive into the basics of mixed media mono printing then Nathalie will introduce you to the Mono Print Painting technique inspired by H.N. Werkman. 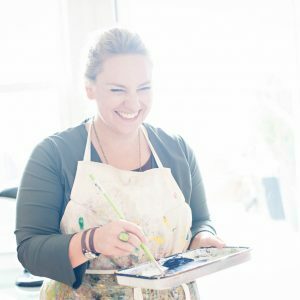 She will show you different ways to create elaborate and layered mono printed paintings using self-made tools as well as stamps and stencils. Find out Nathalie’s thinking process on developing the technique and how you can put your own personal spin on it so that you can take this art form even further! We will have all of the above items in stock, as well. If you would like to have any supplies waiting for you, please zip Kristin an email. Price: $312 which includes lunch, drinks & snacks both days as well as some supplies. 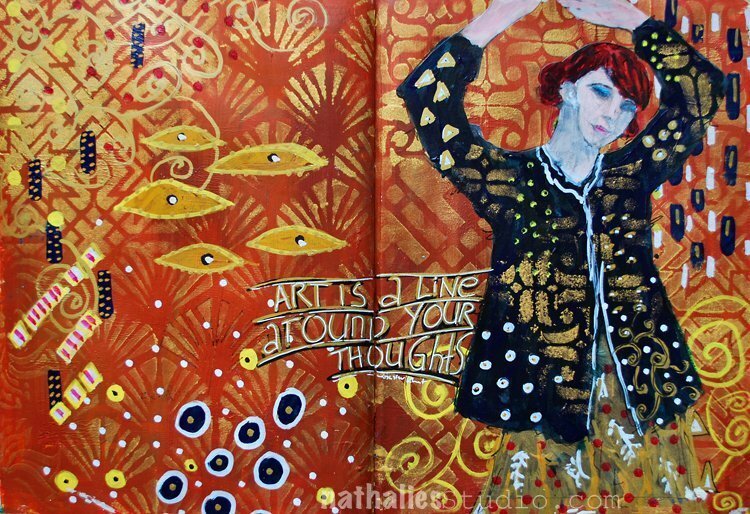 Let’s go on an Artful Adventure together and explore all the different ways to find inspiration for our Art Journaling! Pack your bags with the basics for this 2-day adventure. We’ll explore color theory and ways to master composition with the Principles of Art. As our journey begins we’ll meet some of the great artists of the world and see how their style and methods can inspire our own creations. Then as we travel together we’ll spend some time exploring transfer techniques, collage and layering processes, and ways to create both visual and actual texture. All along the way, we’ll be gathering inspiration from the sights we see and the people we meet. 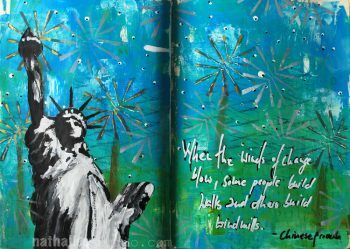 We’ll pull everything together when we reach our destination – the pages of our Art Journal! We will have all of the above items in stock, as well. *If you would like to have any supplies waiting for you, please zip Kristin an email. If both classes appeal to you, register for the Discounted Weekend Rate and save $60! You may also register for the entire weekend paying a $99 Deposit which holds your spot and allows you to pay over time. Please note that your $99 deposit is nonrefundable but is applied to your balance. Full payment is due no later than April 1, 2018, and can be made on this page via PayPal or Credit Card. Before registering for classes, please familiarize yourself with our Cancellation Policies.